The best way to celebrate Bastille day is at my local favourite – Cafe Brione in Eastcote, Greater London. By chance, they have just introduced a new breakfast/brunch menu that I just had to try. Delphine & Dom now have a new member of the team – Elisabelle, the chef who cooked my Bastille day breakfast. 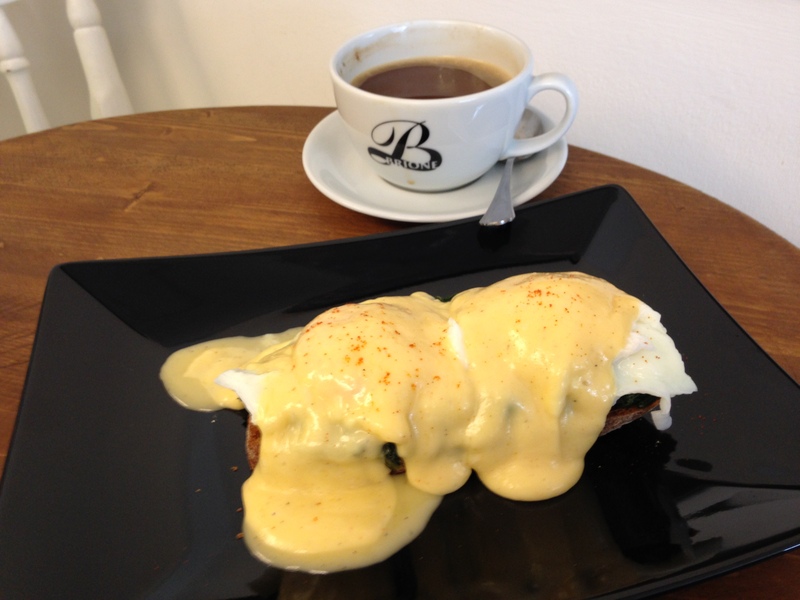 I chose Oeufs Florentine, poached eggs on spinach, sourdough toast topped with Hollandaise . How did it taste? Delicious! Soft runny eggs, perfect Hollandaise, well cooked spinach on crunchy sour dough toast – fit for a king or queen (deposed) or a revolutionary! Love to have gone to the Bastille day celebration but was away on hols. Just want to say Lindsay that I really enjoy tast2taste – full of ideas and good information. Thanks for your lovely comments and support. It would be great to write a review on one of the restaurants we decide to go to in Crouch End or Stroud Green in the future.